Dickens’ A Christmas Carol was first published on December 19, 1843.1)The base text used here is from Project Gutenberg, and derived from the first edition. I have made minor edits based on standardizing the British orthography and some decisions made by Dickens in later editions. The footnotes are mine. Written in a feverish haste during a time when, despite his best-selling author status and the on-going sales of the serialized Martin Chuzzlewit , Dickens was terribly short of money, Dickens managed to write the entire work in six short weeks, and personally oversaw the book’s production and printing. He even commissioned noted artist John Leech to create four hand-colored etchings and another four black and white wood engravings as illustrations. Dickens also saw to it that the book had an elaborate binding and gilt-edged pages. A Christmas Carol was an immediate success, The first printing of 6,000 copies sold out in days, and a subsequent printing of 2,000 copies was sold out by the 6th of January. Although the book didn’t make nearly enough money to alleviate Dickens’ financial problems, its social impact inspired Dickens to write special “Christmas” books for several years, most notably The Chimes and The Cricket on the Hearth . 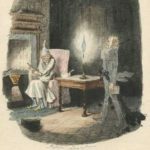 Despite the absence of immediate commercial success for A Christmas Carol, Dickens did have a very salutary, and ongoing, impact on English society and custom. Dickens began to read his work publicly, using a special version he edited himself for dramatic readings. In fact the initial popularity of the book was such that there were eight stage adaptations in production within months of the book’s initial publication. 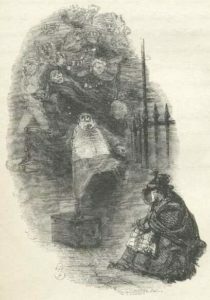 The long term cultural effects of Dickens’ A Christmas Carol have been profound, so profound that more than one writer as identified Dickens as “the man who invented Christmas,” in terms of social customs, and associations about Christmas traditions, ranging from a Christmas turkey, instead of a goose, Christmas games (and caroling) and the perhaps popularizing further the German tradition of the Christmas tree, begun by Queen Victoria. 2)Dickens’ decision to use “Carol” in his title is a reference to the custom of Christmas carols. Originally these were medieval ring-dances, with a song sung to be danced to, and not reserved for Christmas. their houses pleasantly, and no one wish to lay it. 3)The work has a total of five sections, which Dickens called “staves,” an archaic word meaning “stanza”, a sideways nod the the idea that the novella is itself a carol. Oh! But he was a tight-fisted hand at the grindstone, Scrooge! a squeezing, wrenching, grasping, scraping, clutching, covetous, old sinner! Hard and sharp as flint, from which no steel had ever struck out generous fire; secret, and self-contained, and solitary as an oyster. The cold within him froze his old features, nipped his pointed nose, shrivelled his cheek, stiffened his gait; made his eyes red, his thin lips blue; and spoke out shrewdly in his grating voice.4)Dickens is here indulging in a bit of physiognomy, the belief that human psychology and characteristics are revealed by facial features. A frosty rime was on his head, and on his eyebrows, and his wiry chin. He carried his own low temperature always about with him; he iced his office in the dog-days;5)”Dog days” refers to both the hot, sultry period of summer between early July and early September, and, by inference, a period of stagnation. It’s a literal translation of Latin diēs canīculārēs, Dog Star days, a reference to the Dog Star Sirius, which rises and sets with the sun between July and early September, the “dog days of summer.” and didn’t thaw it one degree at Christmas. External heat and cold had little influence on Scrooge. No warmth could warm, no wintry weather chill him. No wind that blew was bitterer than he, no falling snow was more intent upon its purpose, no pelting rainless open to entreaty. Foul weather didn’t know where to have him. The heaviest rain, and snow, and hail, and sleet, could boast of the advantage over him in only one respect. They often “came down” handsomely, and Scrooge never did. Once upon a time—of all the good days in the year, on Christmas Eve—old Scrooge sat busy in his counting-house. It was cold, bleak, biting weather: foggy withal: and he could hear the people in the court outside, go wheezing up and down, beating their hands upon their breasts, and stamping their feet upon the pavement stones to warm them. The city clocks had only just gone three, but it was quite dark already—it had not been light all day—and candles were flaring in the windows of the neighbouring offices, like ruddy smears upon the palpable brown air. The fog came pouring in at every chink and keyhole, and was so dense without, that although the court was of the narrowest, the houses opposite were mere phantoms. To see the dingy cloud come drooping down, obscuring everything, one might have thought that Nature lived hard by, and was brewing on a large scale.6)Lodon had serious air pollution problems, principally, because of the use of coal for heat. Chimneys had no filters, hence the air in a crowded metropolis like London was quite literally brown with coal dust, and sulphuric acid created by the action of moist fog upon the coal. The door of Scrooge’s counting-house was open that he might keep his eye upon his clerk, who in a dismal little cell beyond, a sort of tank, was copying letters. 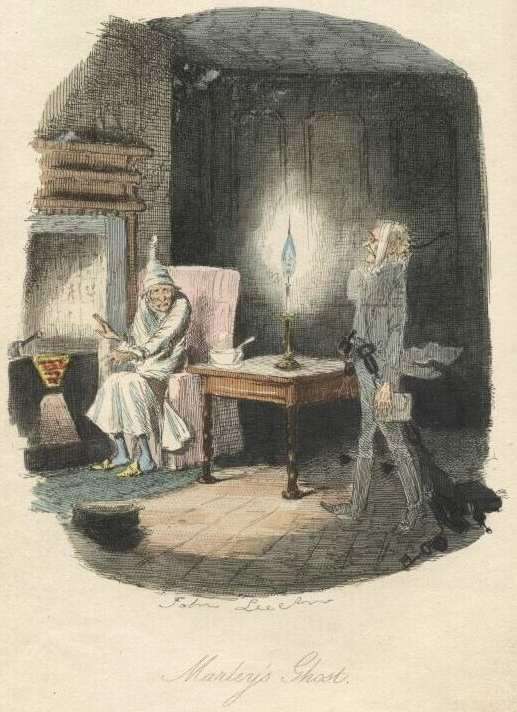 Scrooge had a very small fire, but the clerk’s fire was so very much smaller that it looked like one coal. But he couldn’t replenish it, for Scrooge kept the coal-box in his own room; and so surely as the clerk came in with the shovel, the master predicted that it would be necessary for them to part. Wherefore the clerk put on his white comforter,7)A narrow, long, typically woolen neck scarf. and tried to warm himself at the candle; in which effort, not being a man of a strong imagination, he failed. Scrooge said that he would see him—yes, indeed he did. He went the whole length of the expression, and said that he would see him in that extremity first.10)This is Dickens excessive delicacy in avoiding specifying that Scrooge says he would see his nephew in Hell first, before coming to Christmas dinner. “Good afternoon, ” said Scrooge. “We have no doubt his liberality is well represented by his surviving partner, ” said the gentleman, presenting his credentials. “Plenty of prisons, ” said the gentleman, laying down the pen again. “The Treadmill12)The treadmill or treadwheel was used in Victorian prisons as both punishment and productive labor; prisoners sentenced to hard labor would “climb” the treadmill, turning the wheel and, usually, thereby grinding grain for flour. It truly was hard labor. and the Poor Law13)In earlier days, England’s Poor Law essentially said that the poor had to be given relief in terms of food, and fuel mostly, by the parish where they resided. This was paid for by taxes, and in 1834 a desire to reduce expenditures resulted in the Poor Law Amendment which said that if the poor needed assistance of any sort, they had to go to a work house. In return they were issued a uniform, and put to work at fairly demanding physical labor for several hours a day, and fed short rations consisting of thin soup and bread. Families were broken up, and this often meant that children were separated from parents and siblings for ever. are in full vigour, then?”said Scrooge. Meanwhile the fog and darkness thickened so, that people ran about with flaring links,14)Flaring links refers to torches made with tow, and covered with pitch or tar, used to light the streets. proffering their services to go before horses in carriages, and conduct them on their way. The ancient tower of a church, whose gruff old bell was always peeping slyly down at Scrooge out of a Gothic window in the wall, became invisible, and struck the hours and quarters in the clouds, with tremulous vibrations afterwards as if its teeth were chattering in its frozen head up there. The cold became intense. In the main street, at the corner of the court, some labourers were repairing the gas-pipes, and had lighted a great fire in a brazier, round which a party of ragged men and boys were gathered: warming their hands and winking their eyes before the blaze in rapture. The water-plug being left in solitude, its overflowings sullenly congealed, and turned to misanthropic ice. The brightness of the shops where holly sprigs and berries crackled in the lamp heat of the windows, made pale faces ruddy as they passed. Poulterers’ and grocers’ trades became a splendid joke: a glorious pageant, with which it was next to impossible to believe that such dull principles as bargain and sale had anything to do. The Lord Mayor, in the stronghold of the mighty Mansion House, gave orders to his fifty cooks and butlers to keep Christmas as a Lord Mayor’s household should; and even the little tailor, whom he had fined five shillings on the previous Monday for being drunk and bloodthirsty in the streets, stirred up to-morrow’s pudding in his garret, while his lean wife and the baby sallied out to buy the beef. “You’ll want all day to-morrow, I suppose?” saidScrooge. “And yet, ” said Scrooge, “you don’t think me ill-used, when I pay a day’s wages for no work.”16)The as yet-unnamed clerk works six days a week, for 1/2 crown per day, that is two shillings and six pence, or one eighth of an English pound before the currency reform. The sound resounded through the house like thunder. Every room above, and every cask in the wine-merchant’s cellars below, appeared tohave a separate peal of echoes of its own. Scrooge was not a man to befrightened by echoes. He fastened the door, and walked across the hall, and up the stairs; slowly too: trimming his candle as he went. You may talk vaguely about driving a coach-and-six up a good old flight of stairs, or through a bad young Act of Parliament; but I mean to say you might have got a hearse up that staircase, and taken it broadwise, with the splinter-bar towards the wall and the door towards the balustrades: and done it easy. There was plenty of width for that, and room to spare; which is perhaps the reason why Scrooge thought he saw a locomotive hearse going on before him in the gloom. Half-a-dozen gas-lamps out of the street wouldn’t have lighted the entry too well, so you may suppose that it was pretty dark with Scrooge’sdip. Sitting-room, bedroom, lumber-room. All as they should be. Nobody under the table, nobody under the sofa; a small fire in the grate; spoon and basin ready; and the little saucepan of gruel (Scrooge had a cold in his head) upon the hob. Nobody under the bed; nobody in the closet; nobodyin his dressing-gown, which was hanging up in a suspicious attitude against the wall. Lumber-room as usual. Old fire-guard, old shoes, two fish-baskets, washing-stand on three legs, and a poker. “Who were you then?” said Scrooge, raising his voice. “You’re particular, for a shade.” He was going to say “to a shade, ” but substituted this, as more appropriate. “Can you—can you sit down?” asked Scrooge, lookingdoubtfully at him. “I don’t know, ” said Scrooge. “I do, ” replied the Ghost. “You must have been very slow about it, Jacob, ” Scrooge observed, in a business-like manner, though with humility and deference. “But you were always a good man of business, Jacob, ”faltered Scrooge, who now began to apply this to himself. “I—I think I’d rather not, ” said Scrooge. 1. ↑ The base text used here is from Project Gutenberg, and derived from the first edition. I have made minor edits based on standardizing the British orthography and some decisions made by Dickens in later editions. The footnotes are mine. 2. ↑ Dickens’ decision to use “Carol” in his title is a reference to the custom of Christmas carols. Originally these were medieval ring-dances, with a song sung to be danced to, and not reserved for Christmas. 3. ↑ The work has a total of five sections, which Dickens called “staves,” an archaic word meaning “stanza”, a sideways nod the the idea that the novella is itself a carol. 4. ↑ Dickens is here indulging in a bit of physiognomy, the belief that human psychology and characteristics are revealed by facial features. 6. ↑ Lodon had serious air pollution problems, principally, because of the use of coal for heat. Chimneys had no filters, hence the air in a crowded metropolis like London was quite literally brown with coal dust, and sulphuric acid created by the action of moist fog upon the coal. 7. ↑ A narrow, long, typically woolen neck scarf. 8. ↑ Boiled puddings were already a tradition when Dickens was writing. Essentially the consist of seasonings, a base (eggs, flour, bread crumbs, suet, etc.) that are combined in put in a bag with room for the contents to expand after the entire bag is placed in boiling water for some time. 9. ↑ Holly, whose bright green leaves and red berries are particularly visible in winter, was already associated with Christmas in the 14th century. The tradition of putting a Holly spear through the heart o a murder was believe to stop the individual from rising from the grave. Dickens also alludes to a stake of Holly as a remedy in his earlier novel The Old Curiosity Sho (1841) which ends with Quilp buried with a stake of Holly through his heart because he is assumed to be a suicide. 10. ↑ This is Dickens excessive delicacy in avoiding specifying that Scrooge says he would see his nephew in Hell first, before coming to Christmas dinner. 12. ↑ The treadmill or treadwheel was used in Victorian prisons as both punishment and productive labor; prisoners sentenced to hard labor would “climb” the treadmill, turning the wheel and, usually, thereby grinding grain for flour. It truly was hard labor. 13. ↑ In earlier days, England’s Poor Law essentially said that the poor had to be given relief in terms of food, and fuel mostly, by the parish where they resided. This was paid for by taxes, and in 1834 a desire to reduce expenditures resulted in the Poor Law Amendment which said that if the poor needed assistance of any sort, they had to go to a work house. In return they were issued a uniform, and put to work at fairly demanding physical labor for several hours a day, and fed short rations consisting of thin soup and bread. Families were broken up, and this often meant that children were separated from parents and siblings for ever. 14. ↑ Flaring links refers to torches made with tow, and covered with pitch or tar, used to light the streets. 15. ↑ Dunstan Known as Dunstanus in Latin, he lived c.909 – 19 May 988 AD. Saint Dunstan was an Abbot of Glastonbury Abbey, a Bishop of Worcester, a Bishop of London, and an Archbishop of Canterbury, canonized as a saint in 1029. Dunstan is celebrated for his efforts towards ecclesiastic and monastic reforms under the English kings. A jeweler and gold smith, a musician and an illuminator of manuscripts, Dunstan is principally known for having fought off the devil with his silver-smithing tongs. 16. ↑ The as yet-unnamed clerk works six days a week, for 1/2 crown per day, that is two shillings and six pence, or one eighth of an English pound before the currency reform.